Add comfort and safety to your bathtub or shower, and gain some added benefits at the same time. This versatile mat will work in just about any bathroom thanks to it's slightly compact sizing, and it will make the surface of your tub or shower less slippery, and more comfortable to stand on. The high quality surface is a pleasure when compared to standard finishes, and it will actually stimulate blood flow and massage your feet as you wash. The entire surface is covered with varying sizes of reflex bubbles that will gently apply pressure to your soles as you stand in the shower, or your back as you lean on them while bathing. At the front of the mat there is a section of longer, flexible bristles that will allow you to wash your feet and toes without bending over. Simply move your feet back and forth over the little fingers and your feet will be cleaner than ever with less time and effort required. When not in use, hang by the hole on the other end to drip dry and reduce maintenance and frequency of cleaning. Thanks to universal sizing and versatile usage this non-slip mat would make an ideal addition to the bottom of any bathtub or shower stall. At 15" x 15", this non-slip mat will fit perfectly in small shower stalls or larger bathtubs without trouble. Although slightly compact when compared to longer mats, this aspect allows for versatility, and the surface area offered is more than ample to totally cover the amount of space that you take up while standing. Because it is shorter than some other mats, it allows you to use it in a shower or bath, but you can also use it on the floor or the wall depending upon the way you are washing. When showering, simply place it on the bottom like normal, but when taking a bath, it can also suction to the wall to become a backrest instead. The same comfortable bubbles that make it feel nice while standing will also add comfort when you lean back in the tub. The varied surface texture will massage and comfort your back while you soak in the tub, and because it has a good number of powerful suction cups, it will remain in place no matter what surface you adhere it to. Don't settle for a regular non-slip mat for the floor in your bathtub or shower. This one offers all of the same safety benefits, but it will also pamper your feet as you stand there, and it will actually wash them for you too. Add some soap directly to the bristles, or just let it collect the run off from the rest of your washing. The mass of flexible bristles will build a rich lather quickly in order to deep clean and scrub your feet. You only need to move them back and forth, one at a time, across the surface, and your toes and feet will be cleaner than ever with very little time or effort needed. The hundreds of little fingers will flex and bend to get between your toes, and they will spread out to wash a large amount of skin at once. The bristles feel great against your body, and are powerful enough to produce better results than bending and straining with a washcloth can achieve. On top of making it easier than ever to wash each foot, this versatile mat will also provide a gentle massage at all times while you stand on it. Stop worrying about unsafe surfaces that are too slippery, and don't bend and stretch just to get your feet clean. Add this mat to any bathroom for increased stability while washing, and to pamper your feet each and every day. Order Yours Today! Dimensions (l x w) 15" x 15" x 1"
Material Durable, long lasting plastic. Non-Slip Yes - Provides a slip-proof surface for the bottom of your bathtub or shower. Suction Cups Yes - Many strong suction cups will hold this mat in place no matter hwere you put it. 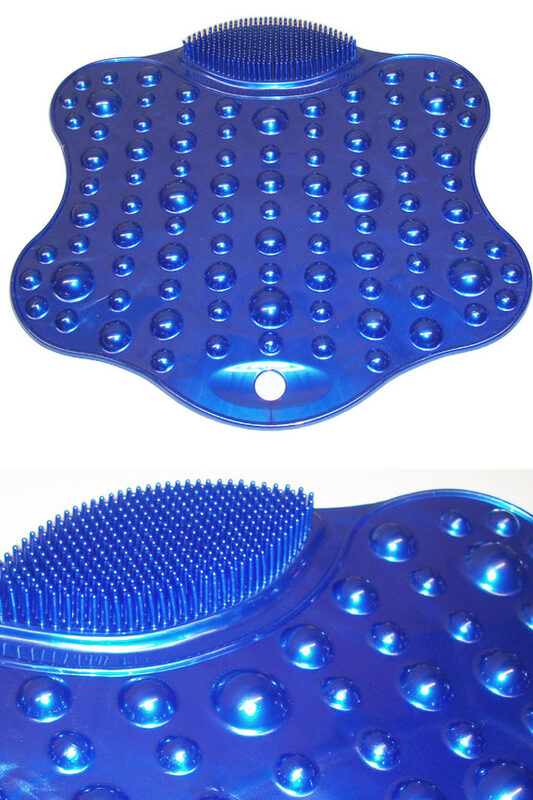 Massage Surface Main area of mat has reflex bubbles that stimulate and massage while they provide a comfortable surface to stand on. Cleaning Surface Smaller, front section of bristles. Tub and Shower Mat - Provide a non-slip surface for the bottom of your tub and gain added benefits. This handy little mat is comfortable to stand on, and will keep you safe, but also features an efficient way to wash your piggies without bending over. Order Yours Today!